No more boring runs on the treadmill! Learn racecourses and landmarks BEFORE you run them. Designed to work with your exisitng equipment. This item is available as a digital file for electronic delivery only. A download link and activation key will be provided on the invoice screen after completion of your order. If you choose not to download software file immediately after purchase, you may obtain both your download link and activation key at any time by logging into your customer account. Multi-user capability for up to 5 users with separate data storage for saved videos and footpod calibration. 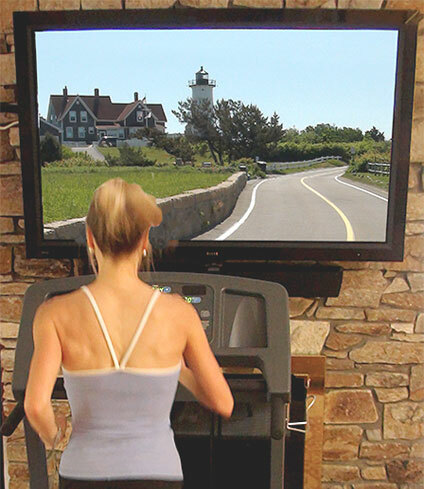 Currently, Virtual Runner is limited to a 15:00 per mile or faster pace point. In order for the software to function at all, you must be able to maintain at least a pace of 15:00 per mile (4 miles per hour). iPAD and Android device customers, please purchase your videos through the in-app shopping page of your Virtual Runner App. Accessories listed below can be purchased from our recommended supplier(s). Click where indicated to learn more or to order online. Already have a footpod, wireless USB receiver and (optional) heart rate monitor?